Based on the XR3i, launched in 1985 as the Series 1 using the mk3 shell, 1986 saw the mk4 and series 2 version, which was manufactured until 1990. The RS turbo added a Garrett T3 turbo and low compression Mahle pistons to the 1.6 CVH engine. Featuring a small front mounted intercooler, the engine management was updated from Bosch K Jet to KE, to give additional electrical functions such as on boost enrichment and overrun fuel cut. Power was 132bhp at 0.5 bar boost. The gearbox featured a viscous coupled LSD (4.2 diff ratio in series 1, 3.8 in series 2), whilst the cars featured various styling modifications (alloys, arches and spoilers). We highly recommend converting the management to OMEX or AEM for limitless power capabilities and driveability. See our RS Turbo Remapping section. This involves the fitment of a Garret –31 actuator, replacement spark plugs, boost is set to hold 10psi and fuelling and engine are setup to suit. This is a basic conversion that really transforms the standard car and will give around 150bhp. This is the same conversion as stage 1 but boost is now increased to 14psi. This is the limit of the standard intercooler. An NMS intercooler, reverse charge carrier and new cam cover to suit are now fitted to the car. A stainless 2.5” exhaust is required, a rewired bosch 044 fuel pump is also fitted and we now recommend changing the std water and boost hoses for silicone items and an uprated engine breather. Boost is set to 18psi still using the standard turbo. Unless the engine has had a recent camshaft, we normally also fit our high torque solid lifter camshaft at this power level. This is the reliable limit of the standard engine and turbo combination. See engine rebuild section for options regarding power beyond 200bhp. The standard con-rods are too weak for reliable power levels over 200bhp and thus a complete new engine is the basis for any engine above this power level. The engine management is also changed to either OMEX 600 up to 300bhp, or AEM Infinity for 300bhp+. 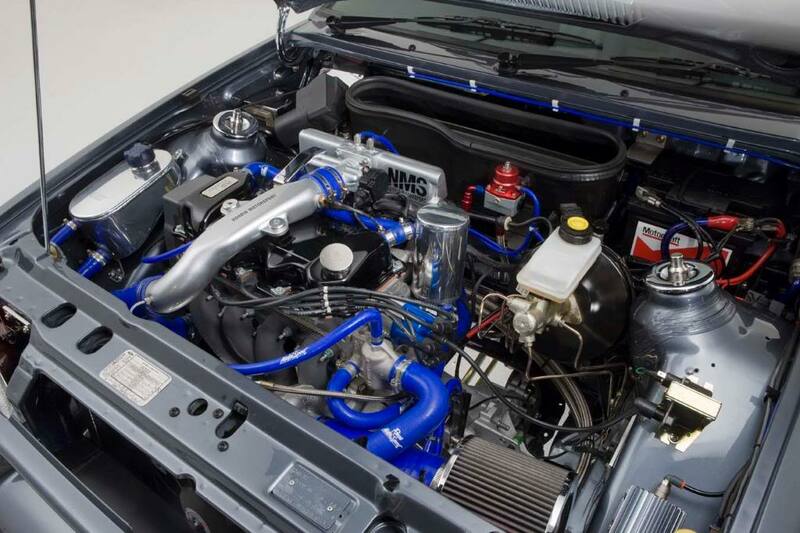 For big power CVH RS Turbo engines up to 450BHP please see our CVH RS Turbo engine build section.